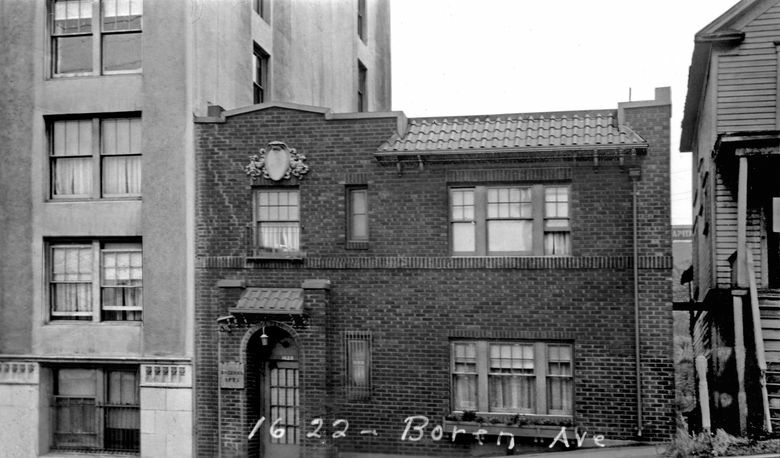 The Rozellna apartments were wiped out in the early 1960s by Interstate 5. Twenty years earlier, a 43-year-old woman died after falling through a window on the 11th floor of the Olive Tower onto the Rozellna’s roof. THE DATE INSCRIBED by hand at the bottom of this subject indicates that this is another tax photo. It is one of a few thousand prints rescued from the “circular file” of the tax assessor’s office more than a half-century ago. The savior was Stan Unger, then a young municipal employee with an interest in local history and its architecture. Mostly dating from 1937-38, we have used several of them with this feature. 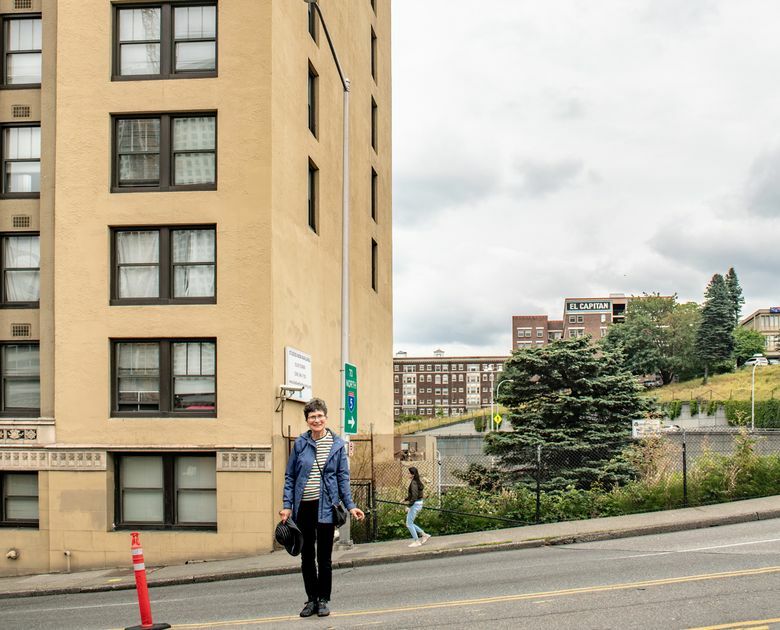 Any Unger saving of tax photos that record lost apartment houses will interest and even excite Diana James, our historian of “Shared Walls,” the title for her book history of Seattle apartment houses. A hoped-for photo of the Rozellna was on her list. In recording his “Now” photo, Jean Sherrard took special care (looked both ways) to quickly pose James at Boren’s center stripe and then get the preservationist back to the curb, where she shared some of her research with us. This well-wrought Rozellna might easily inspire nostalgia, or memories of other missing old buildings, or even surviving modern ones, like the Olive Tower, its high-rise neighbor to the north. Built in 1928, the Olive Tower just missed being razed with the Rozellna in the early 1960s for the building of Interstate 5. James says the last newspaper mention she has of the Rozellna is from 1961. She pointed out — but not while standing in the street — that the bottom three floors of the Olive Tower, where it once snuggled against the Rozellna, show no windows. Three hours after his wife’s jump he dashed to the window, The Times reported, but his “apparent suicide attempt” was thwarted by Coroner Otto H. Mittelstadt, who made a flying tackle of Hart around the knees. Researcher Ron Edge notes one last newsworthy interaction between the two apartment houses when, on Feb. 2, 1960, “High winds peeled a 10-by-30 foot section of brick facing off the Rozellna Apartments.” The illustrated report revealed that the peeled bricks fell to the rear of the Olive Tower. The greater length of the Rozellna helps us imagine room for its 16 units.